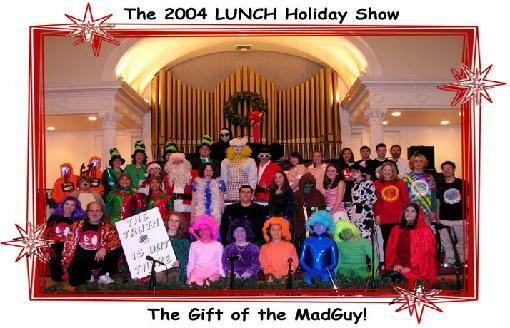 The 2004 LUNCH Holiday Show was a tremendous success, with a cast of 40 kids and musicians putting on an exceptional performance for a packed house, and raising money for local social service agencies. A full photo spread is posted in photo album, along with the 2004 "Who's Who Gallery. "The Gift of the Madguy" was LUNCH's 8th Holiday Show, and we are looking forward to December 3 2005 when we present "A Mall and the Night Visitors", as Dorothy and friends follow the Yellow Brick Road to the Emerald City Mall, to find the Womderful Wizard of Claus. Coming, December 3, 2005 ! ABOVE: December 2004, West Coast Tour #2 -- (Left) Kay and Bill present a donation from LUNCH to the President of the Women and Childrens' Crisis Center in East Whitter, CA, to support A Window Between Worlds, which uses expressive art for healing victims of abuse. (Center) Bill and Kay at Disneyland (Right) At Venice Beach in souther California. 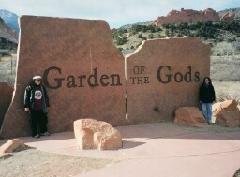 AS OF FALL 2004: LUNCH Goes to the West Coast ! The need for Social Outreach knows no boundaries, and we are proud to announce our first West Coast event. Kay Pere has been in the L.A. area in Oct-Nov, producing and performing a benefit for two great outreach progams -- The Pacific Maritime Ministries, which works with young people in need, and A Window Between Worlds, which uses the arts as a means of healing from abuse. The concert, held on Halloween day, raised more than $1,000 for these charitable agencies. Kay is also performing at a Seniors home, and at some Songwriter events at the FARWest Folk Alliance Conference. Her new CD has met with a great reception. Bill and Kay are back to L.A. in August 2005. 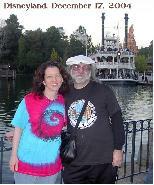 Bill is a guest presenter for the SongsAlive organization. In Fall 2004, the #1 song on the Folk Charts at Artist Launch.com was "High School My School", recorded by Bill and LUNCH. We also had 6 other songs in the top 20 across 3 charts !! ABOVE: LUNCH Spring 2004 events enabled us to present $1,300 to the Pawcatuck Neighborhood Center (left), from the March Hunger Awareness Concert; $1,700 to Care and Share, from the May "Music and Magic" event (center); and $1,000 to World Hunger Year from the Service Learning Concert with Jen Chapin (right) who is accepting the donation. In addition, we raised more than $13, 000 for Social Services and Education Enrichment in the Montville area, from the April Chapin Legacy Show. SUMMER MUSIC CAMP '04 (#9) at Camp Wightman was a great time with 42 campers and leaders putting on a fantastic performance. PHOTOS are posted on the PHOTO ALBUM PAGE. If you'd like to participate in this wonderful experience this year, let us know now ! Spaces are limited. 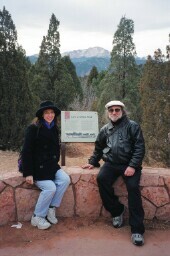 Bill and Kay bring some LUNCH music to Pike's Peak in the Colorado Rockies to ring in the 2004 New Year -- The fireworks from the top of the 14,000 foot peak were spectacular as were the rock formations at Garden of the Gods.